Home/ About Us/ Subsidaries/Hubei Ya Dong Cement Co., Ltd.
Hubei Ya Dong Cement Co., Ltd. (the “Company”) was established in June 2005 by Asia Cement Corporation and Ya DongHolding Co., Ltd., both of which are subsidiaries of Far Eastern Group in Taiwan. The Company is located in Wuhan Yangluo Economic Development Zone, Hubei Province, with a registered capital of US$154.8 million and a total investment amount of US$239.88 million. The Company is situated in the deepwater port area, being the best spot along the midstream region of the Yangtze River, as this section of the Yangtze River is navigable all year round. Moreover, the Company has constructed its own 500m quay. The Company thus enjoys the advantages in both geographical location and convenient transport. The factory of the Company covers a site area of 811 mu, while the quay and beach take up an area of 229 mu, which together comprises a total site area of 1,040 mu. There are currently two clinker production lines ,and each with daily capacity of 5,000 tonnes. 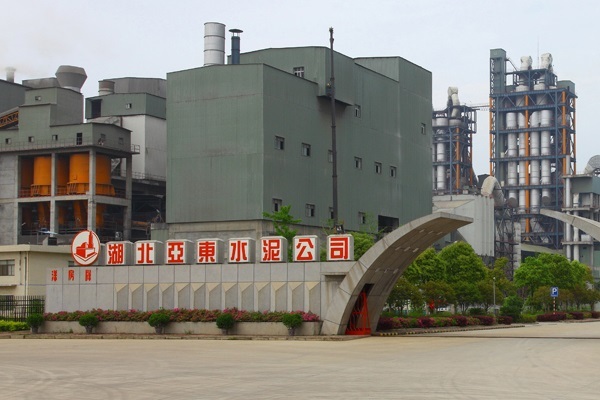 The first production line, with an investment amount of approximately RMB1.4 billion, was put into operation in March 2009; while the second one, with an investment amount of approximately RMB1 billion, was put into operation in October 2010. The Company’s current annual cement capacity is over 4 million tonnes.